There’s a scene in the classic movie Jurassic Park where Jeff Goldblum’s character, a mathematician by the name of Dr. Ian Malcolm, is explaining chaos theory—his area of expertise—in a creepily flirtatious way to another main character, Ellie Sattler. Regardless of the way Goldblum comes off, his simplified explanation of the theory is demonstrated via a water droplet on Sattler’s hand. Each time he places a water droplet, it rolls off in a different direction, influenced by tiny differences such as blood traveling through her hand or imperfections of the skin. Simply put, it’s unpredictable. The other example he gives is that of a butterfly flapping its wings in Peking, with the slight changes in air currents eventually influencing something as big as weather patterns in New York City. These ripples of changes reflect the chaotic world we live in, and while Malcolm’s simplistic explanation leaves out plenty from the field of research, it’s a valuable lesson when you look at the NCAA Tournament, a 68-team bracket filled with endless disorder and disruptions. The No. 16 seed nobody was even remotely thinking about, America East champion UMBC, pulled off the upset for the ages—knocking off the top overall seed in the entire tournament, period. No. 1 Virginia didn’t just lose a nailbiter to the resilient Retrievers, though—they were blown out of the water. After playing to a 21-21 tie in the first half, UMBC lit up the country’s No. 1 defense with 53 second-half points, rolling to a 74-54 win that ended No. 1 seeds’ 135-game undefeated run. (Note: On the women’s side, the upset had already been pulled—back in 1998, No. 16 Harvard knocked off No. 1 Stanford, at the Cardinals’ home court. Gutsy.) That top-ranked defense had previously allowed an average of just 53.4 points per game. Quick tangent: It’s easy to look at the Cavaliers’ recent history of tournament disappointments and blame head coach Tony Bennett’s system, but that’s a weak argument and it’s missing the point. Bennett’s team went 31-2 and lost just one game in one of the tougher conferences in the country—even if the ACC has an equally bad reputation as of late in the postseason, failing to put a single team in the Final Four this season. That’s a topic our sports editor tackled a week ago, here. Back to Bennett: He has taken a program that was meandering around to three one seeds and three ACC regular-season titles over the past five years, outperforming expectations each year. He recruits well for his system and is clearly a smart enough coach to go back to the drawing board and make the adjustments for another run next year. On the other side of the bracket, our favorite ACC program, Syracuse, somehow made it back into the tournament—as predictable as clockwork, despite going 8-10 in the conference and failing to have a justifiable resumé. Regardless, the Orange took it upon itself, once again, to inflict its wrath on the army of angry fans, bloggers, and radio personalities throughout the country. As the 11-seed in the Midwest region, Syracuse would beat Arizona State in the play-in game, knock off No. 6 TCU, score a huge upset of No. 3 Michigan State—a trendy pick for many to win the National Championship—then barely lose by four points in an All-ACC Sweet 16 matchup against No. 2 Duke. I haven’t even talked about No. 11 Loyola-Chicago taking advantage of the dumpster fire of the South region to reach the Final Four, knocking off the 6-seed, 3-seed, 7-seed, and 9-seed in order. Somehow the path got easier for the Ramblers, the perks of watching Kentucky—again, a trendy pick for many—fall to Kansas State while Cincinnati blew a massive lead to Nevada. Sometimes, the water droplets roll down the hand in a way where the seeds that make it to the Elite Eight are ranked one, two, three, and five (the East region was evidently feeling mighty chalky). Other times? You’re looking at the five, seven, nine, and 11, and wondering how on earth the guy leading the ESPN bracket challenge managed to get that right. There’s so many other storylines I could dive into—mainly, how easy it is to fall in love with a team during the NCAA Tournament. Look at Michigan, for instance. Last year, the Wolverines had a scary moment when their plane skidded off the runway after an aborted takeoff, the destination the Big Ten Tournament. They responded by getting there, wearing practice jerseys in a first-round win, then rattling off five-straight wins before eventually falling to Oregon by a point in the Sweet 16. This time around, Michigan’s plane has been in tip-top shape, and so have they. The Wolverines are a delightful team to watch, spearheaded by the smack-talking, big-attitude Moritz “Moe” Wagner, a German forward who sticks out his tongue, flexes, and mean-mugs at every camera he sees. Always grinning and fully ready to celebrate—regardless of if he had anything to do with the play—Wagner is a lot of fun to watch. The same is true with the rest of the Wolverines, who rallied past Loyola-Chicago last night to advance to the national championship after a quick and improbable run through the West region. Michigan took care of business against Montana in the first round, then needed a miracle buzzer-beater from Jordan Poole to escape the clutches of a red-hot Houston team. In all seriousness, how Poole’s shot went in still blows my mind. What’s even more entertaining was the moments after—first, the radio call from Michigan play-by-play announcer Matt Shepard, who just started yelling before simply laughing, with very little coherent English coming over the airwaves. Next, Poole decided to sprint around the court in pure joy, avoiding teammates before they finally collapsed together in a moment of pure catharsis. Finally, the images that emerged from Getty and AP and other assembled photographers were immediately iconic—the picture of Poole running with his teammates in pursuit while Houston’s Devin Davis lies prone in the paint will surely find its way on many a fan’s desktop. After that, they blew out a Texas A&M squad by 27, then hung on to knock off Florida State by four. Out of the last two teams—Villanova is the other I have yet to mention—it’s easy to look at this Michigan team and get behind them. Sure, the Ramblers were everyone’s favorite underdog, but ever since watching Michigan come up short against Louisville in 2013 with a roster that featured players like Trey Burke and Nik Stauskas, it’s been an entertaining team to keep tabs on and root for from time to time. This year is no different—Wagner guided the Wolverines from 10 points down in the second half to an impressive 69-57 win over the Ramblers. Regardless, if you watched the Final Four games last night and saw that half of the bracket ended up entirely chalk while the other half featured two unexpected teams (after all, Michigan wasn’t supposed to be here over the likes of reigning national champion North Carolina, at least in the public eye), take a moment to appreciate the pure chaos that is March. It doesn’t matter that Villanova did exactly what it was expected to do while UVA didn’t, or that Loyola-Chicago is just a team from the Missouri Valley Conference. At the end of the day, there are 9.2 quintillion possibilities in your pursuit for a perfect bracket—don’t even think about narrowing it down by eliminating 16-seeds winning a game. Witnessing the chaotic madness is quite simply the fun of it. 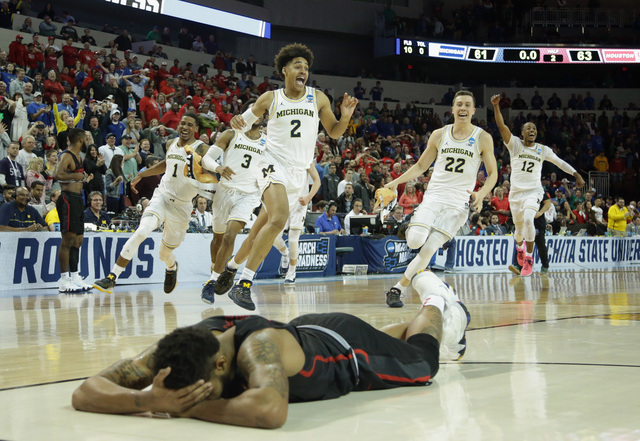 I’ll leave you with a Malcolm quote: “Life uh … finds a way.” Or in this case, each team finds itself on the verge of that “one shining moment,” and March will find a way.